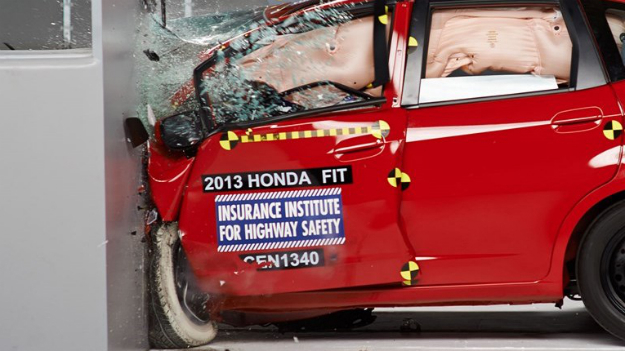 The Insurance Institute of Highway Safety (IIHS) has released the small-overlap crash test results for subcompact cars. The cars tested were the Fiat 500, the Honda Fit, the Mitsubishi Mirage, the Nissan Versa, the Toyota Prius C the Ford Fiesta, the Kia Rio, the Mazda 2, the Toyota Yaris and the Chevrolet Spark. What has alarmed many, is the disappointing ratings many of the cars received. The only vehicle to earn an “acceptable” rating was Chevy’s Spark. The other cars collected either “poor” or “marginal” ratings. The small-overlap crash test is the latest test added to the IIHS arsenal of crash tests. In this test, the car crashes into a barrier that covers just 25 percent of the car’s outmost frontal area at 40 mph, leaving just the headlamp, front fender, front wheel and tire, and firewall to take the brunt of the impact. The test was introduced just over a year ago, and many manufacturers have not been able to update their cars for this specific test. When the test was introduced, many larger cars did poorly in the same test. Many of the subcompact cars have received overall “acceptable” or “good” crash-test ratings. These cars are still safe; this test just highlights one area that automakers will soon be focusing on for optimal safety. It takes time, money, and research and development to pass new crash tests, and most automakers will soon exceed the tests’ expectations. This entry was posted in Uncategorized on January 25, 2014 by Bryan Nguyen. 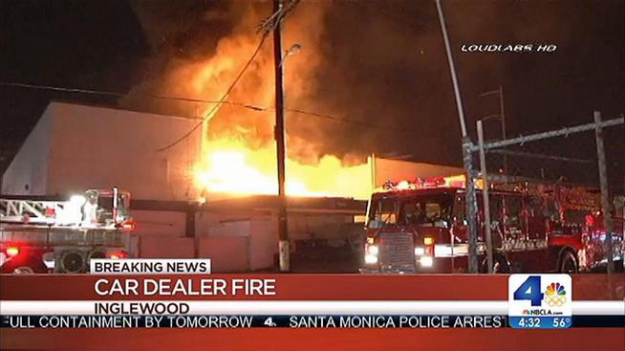 A fire broke out at a vacant car dealership around 2:30 a.m. Tuesday in Inglewood. Firefighters knocked had everything under control in under three hours. Upon arrival, heavy smoke and flames were coming out of the two-story commercial building, according to officials. “It used to be a Honda dealership, it’s been vacant for a few months,” Los Angeles Fire Department Asst. Chief Ralph Terrazas said in an interview with NBC Los Angeles. 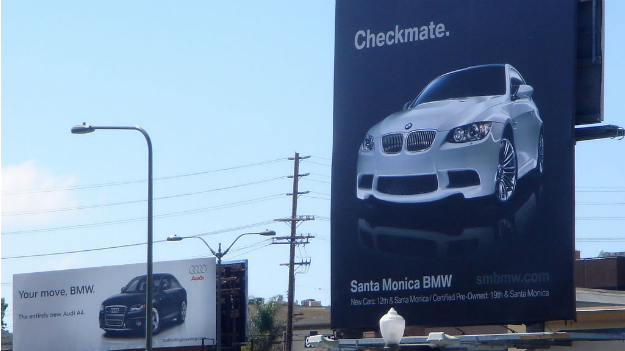 The dealership is located on the 5200 block of of Centinela Ave. near La Cienega Blvd. Two homeless people had to be rescued by firefighters. They were on the roof when firefighters arrived on the scene. They searched the vacant building for any additional homeless people who could have been staying in the space. It took approximately 120 firefighters to battle the blaze Tuesday. It wasn’t clear what departments were called to assist in fighting the incident. No injurers were reported from the incident. The cause of the fire is currently under investigation. No other information is available at this time. This entry was posted in Uncategorized and tagged California, dealership fire, fire, law, lawyer, Los Angeles, los angeles fire department on January 22, 2014 by Bryan Nguyen. The Toyota FT-1 Concept revealed at the 2014 North American International Auto Show could signal the return of the legendary Toyota Supra. While not many details are known about the concept, it is still an engine-less design visualization. 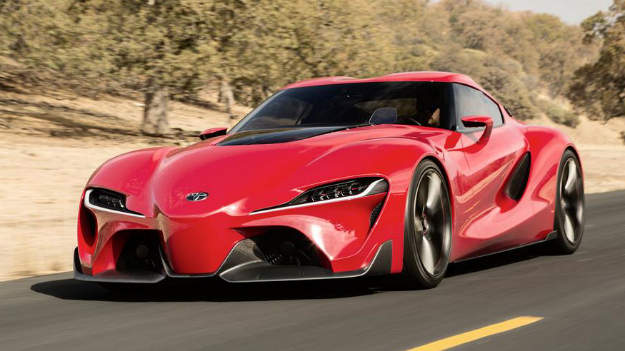 It was designed at Toyota’s Calty design studio in Southern California in cooperation with Sony’s Polyphony Digital, makers of the Gran Turismo video-game franchise. While rumors about the return of the Supra have been swirling since the mid-2000s, when Toyota introduced the Scion FR-S, it got many thinking that Toyota could be making a valiant push back into the sports car arena. An interesting aspect of the FT-1 Concept is that it has likely been born out of a recent partnership with BMW that is supposed to yield a new sports car jointly designed by the two companies. It is unclear right now which company will lead the design and engineering, but even with Toyota bringing this concept to fruition and revealing at the auto show, there is hope that some sort of production vehicle based on this concept could be seen in the future. It’s also best to remember that when Toyota was working with Subaru to bring the FR-S/BRZ to market, they released numerous concepts before the final, toned-down production version was revealed, leaving many bored with the styling. This entry was posted in Uncategorized and tagged Auto Show, cali, California, Detroit Auto Show, FT-1 Concept, law, lawyer, NAIAS, north american international auto show, Supra, Toyota FT-1, Toyota FT-1 Concept on January 17, 2014 by Bryan Nguyen. Domino’s Pizza and Ford have teamed up to solve a problem you didn’t know you had. They are bringing a brand-new food-ordering platform to your car. Right now, the process is a bit convoluted and limited to a customer’s saved Domino’s Easy Order, but with a few voice commands, one could have an order placed in short time. The two companies unveiled their in-car ordering app at the 2014 International Consumer Electronics Show in Las Vegas. The system works by using the Ford SYNC AppLink in-car connectivity system in conjunction with the Domino’s smartphone application. 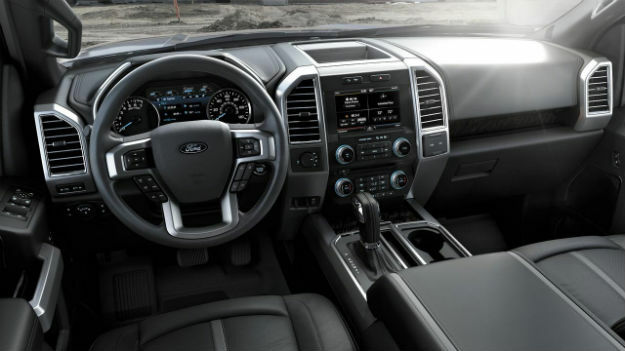 The AppLink system allows drivers to control selected apps on connected smartphones using the SYNC steering-wheel-mounted button in equipped Ford vehicles. A date for the app’s ordering ability has been released, but is expected to be available soon. 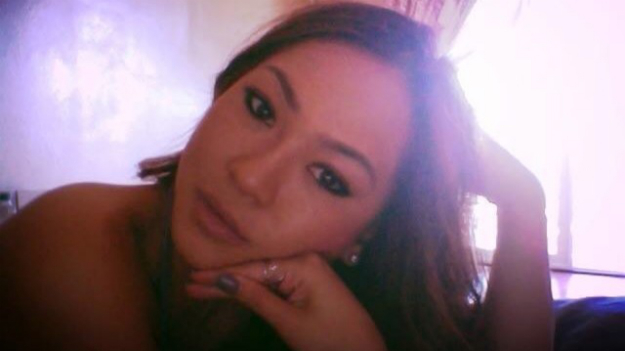 This entry was posted in Uncategorized and tagged app, CES, Consumer Electronics Show, Domino's, Domino's Pizza, FoMoCo, Ford, Ford Motor Company, in-car, ordering app, Pizza on January 8, 2014 by Bryan Nguyen. Ford is unveiling a new concept car at the 2014 Consumer Electronics Show in Las Vegas, the Ford C-Max Solar Energi concept. Based off the C-Max Energi, Ford’s plug-in hybrid, the Ford C-Max Solar Energi Concept adds a solar-powered charging apparatus as its battery pack. Ford has had a present at CES over the last few years as it tries to publicize itself as both a car company and a technology company, using the event to highlight numerous technologies in the past. Below the solar array on the roof is a standard Ford C-Max, including the 7.6-kWh lithium-ion battery pack and 2.0-liter four-cylinder engine. 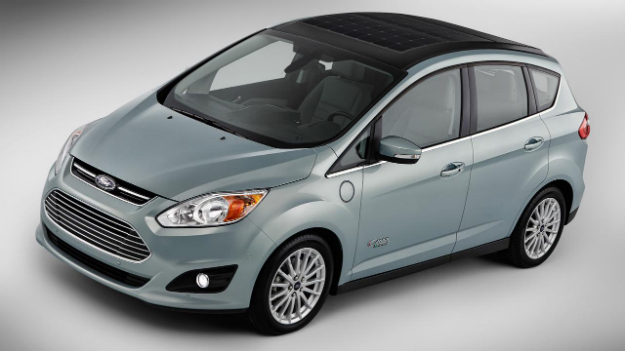 Ford claims the C-Max Solar Energi can travel a claimed 21 miles on electricity alone. Ford isn’t the first company to place solar panels on their car roofs. The Toyota Prius and Nissan Leaf both offer solar panels as options. What differentiates the Solar Energi from the standard model is that instead of obtaining electricity through a power cord, it uses the solar array on the roof. Ford says there is a “concentrator,” or large Fresnel lens, that can take in a constant amount of light regardless of sunlight angle and direction, and intensifies the light on the solar panels. This is in the design of a canopy that is placed over the car when it is parked. 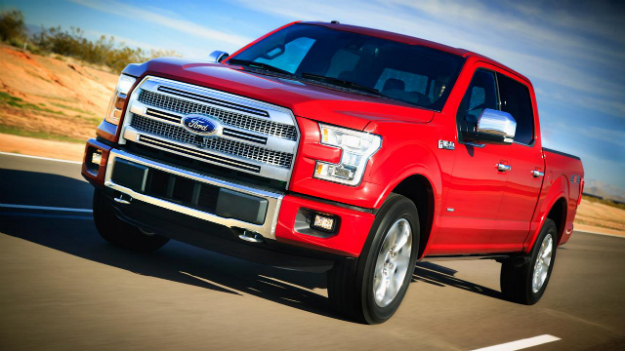 People running off with your “concentrator,” wasn’t addressed by Ford. However, consumers don’t have to worry if the sun isn’t out, Ford kept the charging port in place just in case. Ford worked with Sunpower Corporation and the Georgia Institute of Technology on the panels and concentrator device. While the concept may seem novel, its feasibility is still unknown. Solar panels are still expensive and are not known for converting sunlight into electricity well. Ford says the lens intensifies sunlight by eight times helping the car charge up 8 kW of energy. 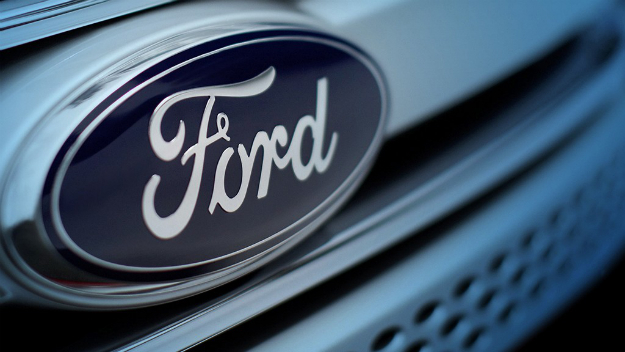 It’s unknown whether Ford’s claim will transfer into real-world results. Ford is considering the car for production in conjunction with the Georgia Institute of Technology, but no official decision has been made. This entry was posted in Uncategorized and tagged attorney, California, CES, concept, concept car, Consumer Electronics Show, Electronics, Ford, Ford C-max, ford concept, Ford Motor Company, las vegas, law, solar energy on January 3, 2014 by Bryan Nguyen.